The property is situated 6km from the medieval village of Bettona, on a wooded hillside within a nature reserve with panoramic views towards Assisi and Perugia. The property comprises main house, pool house and swimming pool (9x4.5m) and is situated in 5,000 square metres of woodland. The property is 10 minutes by car from Bettona and access is by unpaved road. Perugia, Spello and Assisi are 30 minutes away. Main house sleeps 5, however upper and lower floors are not connected internally. Upper floor comprises Living/dining room, double bedroom kitchen and bathroom. Lower floor comprises bedroom (sleeps 3), bathroom and garage. Pool house sleeps 4 and there is also a cot. We are a British family which loves Italy. Our villa in Bettona has been in the family for over 30 years. We love the place as it sits high up above the valley with splendid views towards Assisi on one side and Perugia and the plain towards Lake Trasimeno on the other side and is surrounded by lush forest. Day trips can easily be made to Assisi, Perugia, Lake Trasimeno, Spello, Spoleto, Gubbio, Bevagna and for those keen to go further afield, Siena, Arezzo and Norcia (in the splendid Sibillini mountains where a visit to the "Piano Grande" at Castelluccio is a must) can also all be visited in a day. Also a drive up to the top of Monte Subasio gives you the chance to enjoy spectacular panoramas and there are lots of easy walks around the summit. As the villa sits on top of a hill ridge the summer evenings are cooler than down on the valley floor and there is often a pleasant breeze. Our children love to ride and there is a rustic riding centre nearby (20 minute walk through the woods or 15 minutes by car) which organises treks through the countryside far from any roads. Just ask us for information when booking. Main house has one en-suite with WC and shower. Separate bathroom with WC and shower. One bathroom has a bidet. Pool house has one bathroom with WC, shower and bidet. Living room/dining room/kitchen form one open area. Dining area seats 5. Lounge area contains settee and 2 armchairs, radio but no TV. There is a golf course in Perugia 45 minutes drive. Outside: The swimming pool is not equipped with any form of child security. The property is ideal for children who know how to swim. The property sits in its own garden of 5,000sqm with a swimming pool measuring 9x 4.5m. There is a patio between the swimming pool and pool house which is ideal for barbecues. Pool area is equipped with garden furniture and parasols. 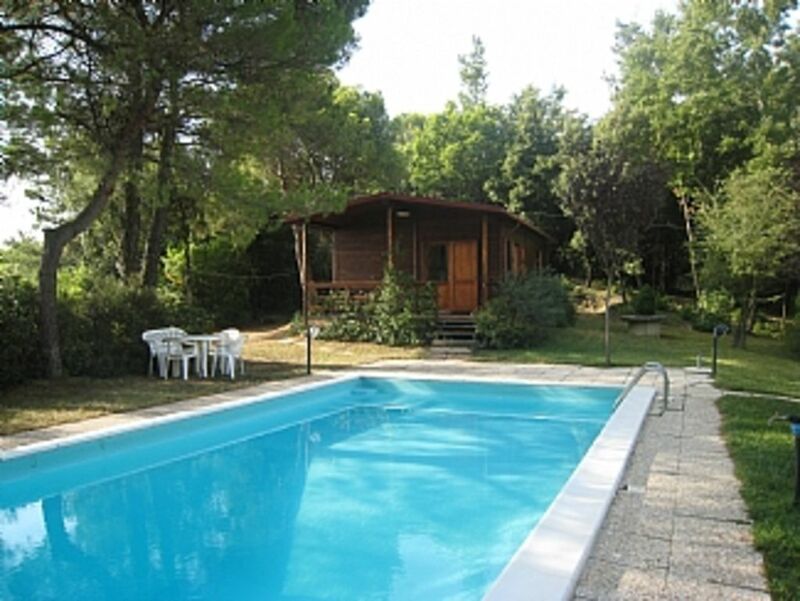 The property is in a tranquil location, off the beaten track, with only one other property nearby. Utility Room: Washing machine and barbecue. Cleaning / Towels / Linen / Maid service: Towels and linen are provided and changed weekly. Property is cleaned weekly (more often on request). we had a wonderful time the main house had everything in that we required. and the pool house was also very comfortable. the pool was kept clean and was attended to regulary. we had a fabulous holiday and would recommend it to everyone. Magnifique demeure perdue dans la forêt, au cœur de l'Ombrie, idéale pour les 7 personnes que nous étions, sans parler de sa piscine et de son Pool house ! Ravie de vous avoir reçu et d'avoir comblé vos attentes. Au plaisir de vous acceuillir à nouveau dans notre belle propriété à Bettona. . Nearest airport is Perugia/Assisi, 30 minutes' drive. A car is essential. Bettona 6km. Assisi and Perugia 30 minutes' drive. aldicchiana shopping outlet 1 hour. Siena 1½ hour drive. Rome 2 hours drive (also accessible by train from Assisi). Nearest restaurant 10 minutes by car. Nearest supermarket, shops, petrol station, banks, post office 15 minutes by car. Booking Notes: Security deposit of £100 payable on booking. Rental payable 6 weeks before rental period start date. Keys are sent by registered mail on receipt of balance. Keys to be returned by registered mail. Security deposit is refunded on return of keys with appropriate deduction for any damages notified by caretaker. Changeover Day: Saturday preferred.